Glad, too, because the package arrived in time for his 100th birthday, which was Sunday. “What a nice, early present this is,” he said. From Roger Freeman’s book, “The Mighty Eighth,” this is believed to be the lead 445th Liberator, captained by John Chilton, with Carlton Hudson aboard. 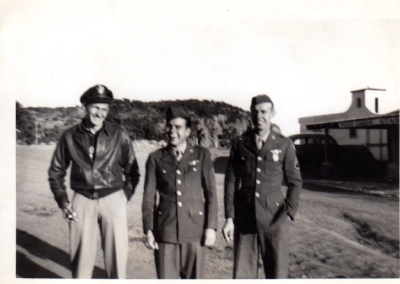 Jim Baynham, left, Ray Lemons, center, Howard Boldt, deceased, right. Corman Bean, navigator on Jim Schaen's ill-fated Kassel Mission crew, has passed at the age of 95. Preceded in death three years ago by his wife, Millie, Mr. Bean passed at his home surrounded by his family. Mr. Bean lived in Birmingham-Bloomfield Hills, Michigan. He visited Bill Dewey, who lived nearby, when George Collar, pilot Jim Schaen's bombardier, came to visit in 1989. Macon, GA--A retired Marine Corps officer has contacted KMHS, indicating he is in possession of a leather “A-2” bomber jacket with the name of a 445th BG Kassel Mission airman hand-printed inside it. The jacket has been sitting in the closet of retired Col. Warren Parker’s closet for more than half a century. Parker feels it’s time for the it to find an appropriate home. The name and serial number inside and just below the back collar tell us that Calvin E. Hess was the original owner. When Parker wrote us with this information, we immediately recognized the name belonging to one of the 117 men of the 445th Bomb Group killed in the fateful Kassel Mission air battle of 27 September 1944. Our question was, how did the jacket come to be in Parker’s hands? Turns out, Parker's uncle attended Lanier High School in Macon, Georgia with William (Bill) Brown, the original copilot on Hess’s crew. Brown had been severely injured when their plane was hit in August, 1944, a month before the Kassel Mission. Brown's heroic story is chronicled by the 2nd Air Division in their weekly news magazine, "Target Victory," which was distributed to all of its airmen on September 30, 1944. The article details Brown's actions under extreme injury and calls him "Man of the Division." 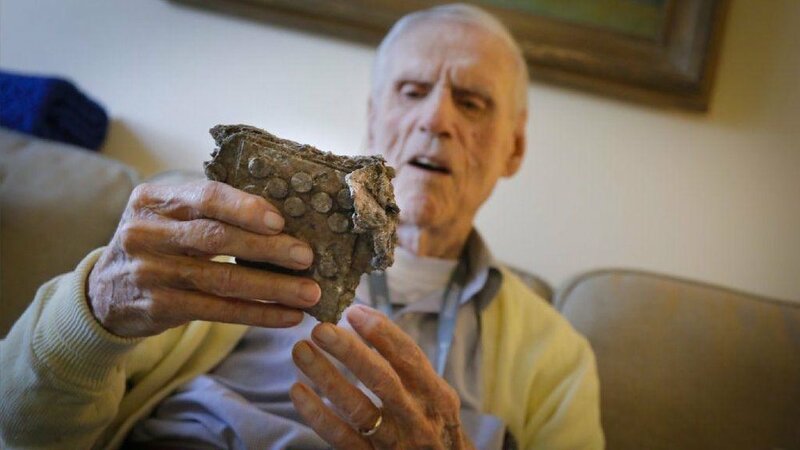 According to the late Kassel Mission bombardier turned historian, George Collar, “[Brown] stayed conscious and helped get that damn plane back down. And when they got him home, they took him out of there and they thought he was going to die, he’d lost so much blood.” Hess, who as engineer was on the deck with the pilots, tied the touniquet around Brown's leg, which he would later lose, but no doubt saved Brown's life. Click here for Brown's complete story. Once they brought the wounded ship in, Brown was immediately sent to the hospital. He lost his leg all the way to the hip. 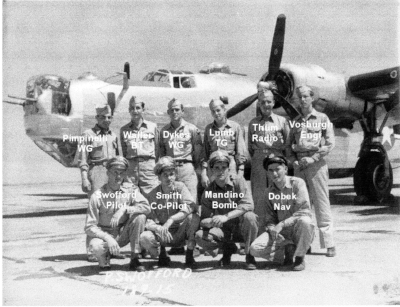 While their B-24, named Bonnie Vee for the pilot's wife, Verlyn, was being repaired, T/Sgt. Hess and the rest of the crew continued to fly missions through August and September until 27 September 1944--Hess's tenth mission--when their plane was again attacked. This time, pilot William Bruce, and possibly engineer Hess who rode in the cabin with the pilots, again watched their replacement copilot become injured, this time mortally. At the moment when his copilot stood to remove Bruce’s seat belt (standard protocol), a shell pierced their ship, severing the copilot at the waist. The plane exploded, and Bruce was thrown clear, although his back was broken. The rest were killed. Says historian Collar: "What was unique about Bruce is the fact that his first co-pilot got his leg shot off, and then the second guy came, a guy by the name of Walter [correction: John] Willett who was a first lieutenant, and poor old Bruce is still a second lieutenant, and this Willett had a lot of flying time but he'd never been in combat, and somebody told him if you ever want to go up the ladder you've got to get in combat. So he had a friend at the 445th who said "Come on over." And so he joined up with the 445th, and they put him on as co-pilot, and it might have been his first—well, no, I don't know how many missions Bruce did between the time Brown got it and Willett—but Willets [sic] got shot..."
On that tragic day only four of 35 bombers sent up by the 445th Bomb Group made it safely back to the base, breaking the record, making it the worst single-day loss for a group from one airfield in history. In the midst of this, T/Sgt. Calvin Hess’s jacket had somehow come into Bill Brown’s possession. As Col. Parker’s wife posits, perhaps Hess covered Lt. Brown with it when the lieutenant was hit a month earlier, and it stayed with Brown then. We do know that, when Bill Brown was shipped home to Lawson General Hospital, stateside in Atlanta, the jacket went with him. At Lawson, Brown saw a familiar face. PFC Bernard M "Ace" Parker, the kid two years behind him in high school ROTC, had stepped on a mine in February 1945 and lost his foot. The two became friends, and both eventually learned to walk with prostheses. Some years later, Ace Parker was walking down the street at Mercer University in Macon, when lo and behold, here came Bill Brown down the steps of a home on that street. After hailing one another, Brown explained he and his wife were living at his mother-in-law's home for a while. They renewed their acquaintance, becoming close friends, and when Brown was moving, Parker's uncle came over to help and saw the bomber jacket. "What's this?" Bernard Parker asked. When Col. Warren Parker was twelve or so, he and his Uncle Bernard went fishing in Macon. It was cold, and his uncle offered the bomber jacket to fend off the chill, then told him to keep it. That was 55 years ago. It has been hanging in a closet ever since, moving with the Parkers wherever they lived. Three weeks ago, Parker saw it hanging in the closet and decided it was time to do something about it; but before he did anything like sell it, he thought he would look on the Internet to see if there was anything about the original owner (something he couldn't have done years ago). Googling “Calvin Hess,” several sites came up. 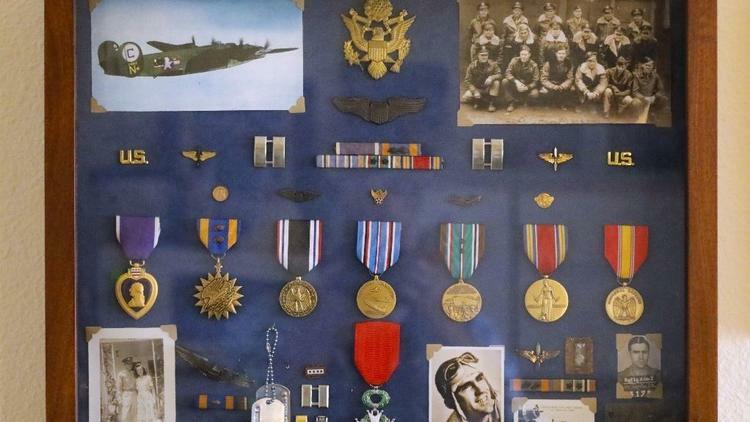 He found Calvin Hess memorialized on the American Air Museum’s website (located at Duxford, England). He also called the staff at the Mighty Eighth Air Force Museum. A few clicks later, he found pictures of Calvin Hess on the Kassel Mission Historical Society website (www.kasselmission.org ). Now the man named had a face, and in that moment became real. Parker read Bill Brown's story on the website and learned how Hess saved Brown’s life. He also saw that there was real connection with Hess for Bill Brown. Parker contacted KMHS through the website. We had Calvin’s nephew's contact information and got in touch with him. Mike Hess is very happy to hear about the jacket. 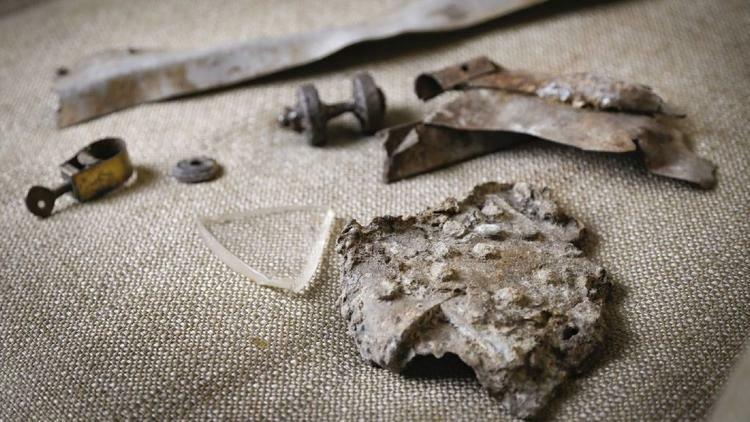 We put the two in touch, and Parker and Mike Hess spoke by phone, agreeing on the Kassel Mission Museum in Eisenach, Germany, where many relics from the crash sites are displayed, should be the ultimate location for the jacket. Col. Parker intends to fly there with his wife on the anniversary of the Kassel Mission this year to present it to the museum. Mike Hess will be there, too. *Bernard Parker currently lives in Macon at 92 years old. According to Parker’s wife, Bill Brown eventually moved to North Carolina. A great athlete before the war, Brown still excelled in golf afterward. He never did find a prosthesis that fit him well and ended up making his own. Even so, he often went without one, she says, walking with crutches. As the years passed, Brown experienced severe phantom pain and a great deal of trouble due to that injury and fought resultant depression in his later years.